Symphonic metal is a term used to describe heavy metal music that has symphonic elements; that is, elements that sound similar to a classical symphony. Symphonic metal is both a genre of metal and a name given to several subgenres of other metal genres, and as such, both forms of usage have slightly varying definitions. The genre refers to bands that combine aspects of varying metal genres, with signature female-led vocals and operatic/classical themes to give the music a feeling of being a symphony. When referring to bands from other genres, it refers to bands who use minor classical and operatic themes in the bands music similar as to what is found in the symphonic metal genre, to show they are more &quot;symphonic&quot; than normal bands of their genre. &quot;Symphonic&quot; can also describe metal with elements resembling non-symphonic classical music, although this definition is not frequently used. ---- Musical characteristics ---- Symphonic metal as a genre takes much of its musical basis from early gothic metal, power metal, and classical music. The guitar and bassline work in the genre often follows the pattern of its originator, gothic metal, by synthesizing other metal styles of guitar. Genres commonly synthesized in this fashion include black metal, death metal, power metal, and progressive metal sometimes with the addition of elements from rock music. The genre typically combines elements of these genres with those of classical music, creating songs with a strong &quot;symphonic&quot; feel. Bands that use elements of rock music typically take a simpler approach to the genre, using simplified and catchy melodies, leading to a more easily accessible and widely accepted version of the music. Another key ingredient to the mixture is the lighter feel of the sounds, typically created by higher, more melodic guitar lines; this characteristic is usually attributed to power metal as well. Keyboards in symphonic metal play the most important role in the music, and are the focal point of the genre around which the rest of the music centers. While most of the instruments play relatively simple parts, the keyboards tend to have the most complex and technically difficult parts. The keyboards alone are used to play the &quot;classical&quot; parts of the music for which the genre is renowned, and covers all forms of classical music. Bands sometimes use orchestras when playing live to play the parts that the keyboardist would play, and at times feature real instruments in recording instead of using digital samples with a keyboard. Atmosphere is commonly tailored to fit the song, although even songs with morbid themes tend to keep an upbeat sense. The atmosphere is particularly denoted by the keyboards and the instruments that they mimic, with the other instruments supporting the landscape evoked by the keyboards. 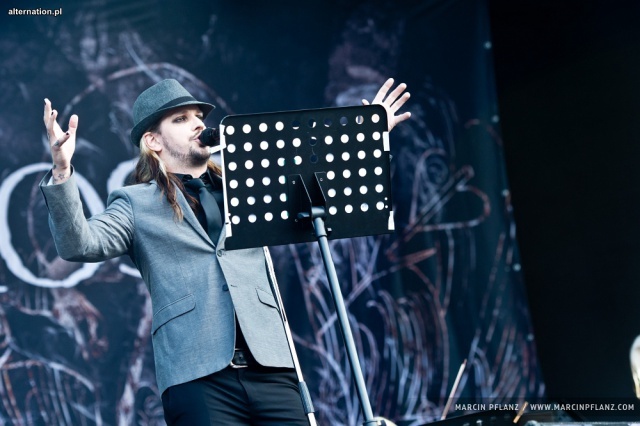 The lyrics of symphonic metal are highly expansive and cover a broad range of topics. Lyrics often borrow heavily from power metal, encompassing various forms of fantasy themes, or use themes typical of opera. Lyrics in symphonic metal, like those of gothic metal, often are arranged into concept albums, styled after epics. 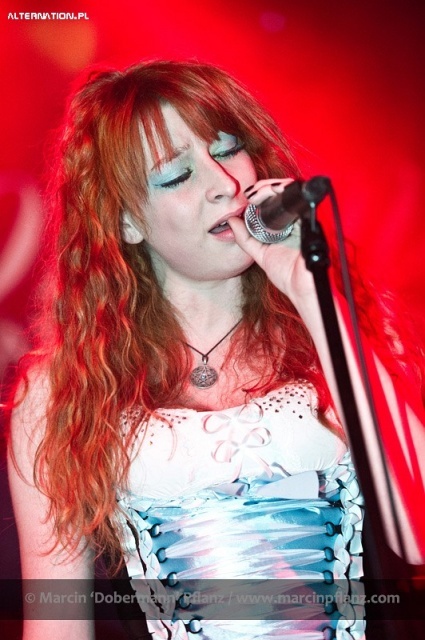 Bands in the symphonic metal genre are mainly female led in both their images and vocals. The vocalists of symphonic metal bands have consistently been female, and tend to sing mezzo-soprano melodies in the operatic style. 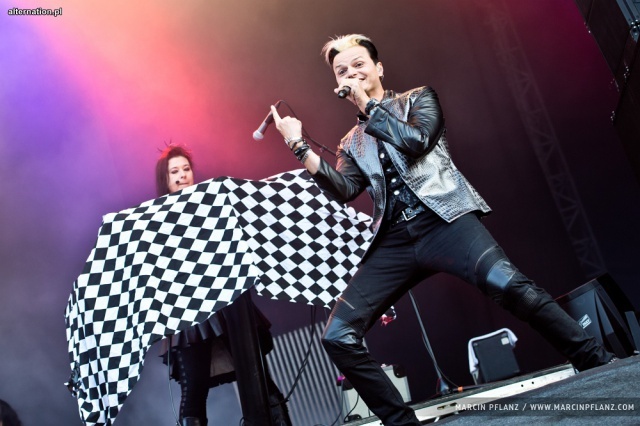 Sometimes symphonic metal artists use a male vocalist for backing vocals, similar to gothic metal's dual vocalists. Other forms of vocals are also sometimes found in songs, but are normally only used as an effect within the song. Symphonic metal bands with male lead singers usually fall into the symphonic power metal category. ---- Brief History ---- The first origins of symphonic metal as a genre begins with early bands in the death metal and gothic metal genres, which made some use of symphonic elements in their music. Of such bands, Therion was the first to feature a fully live orchestra and write their music with the symphonic elements of classical music as an essential inclusion into their musical style. Over time Therion grew further away from their death metal roots, and utilized more symphonic elements and based their music around their symphonic aspects that they became known for. In 1997, Nightwish and Within Temptation released their first albums, and both bands followed heavily in the trend of Therion's symphonic nature. Within Temptation, using influence from gothic metal's synthesizing of other genres, used simpler aspects of the genres in their synthesis. Centering their music around the abilities of their female singer, Sharon den Adel, and the symphonic nature of their use of keyboards, the band reduced the use of male vocals to sparse backing vocals. Nightwish followed a similar trend, employing a style evocative of power metal and using a female vocalist with heavy use of classically influenced keyboarding. In the early 2000s a surge of symphonic metal occurred, with many bands releasing albums. Rain Fell Within, After Forever, Epica, and Edenbridge all released albums around this time, displaying prominently the characteristic keyboards and female vocals. These bands also emphazised the upbeat nature of the music. This boom of symphonic metal bands also began to take more influence from power metal, borrowing from the lyrical theme of fantasy and the stylized, epic-like keyboards of that genre. Bands that are primarily death metal, doom metal, gothic metal, power metal, or even black metal have also been classified as symphonic metal. While symphonic metal is regarded by many as a separate sub-genre of heavy metal, some argue that it is a style that can be of any heavy metal sub-genre. Regardless, symphonic metal tends to be more popular in areas where the above-mentioned sub-genres are better entrenched, such as Europe. Also, the first symphonic metal bands were from Europe and used European orchestras in their music ---- Symphonic Metal Crossovers ---- Symphonic metal, in regard to other genres of metal, encompasses any band that makes use of keyboarding akin to symphonic, classical, or gothic themed music. The use of symphonic aspects in varying forms of metal has been around for many years, however, symphonic metal is centered around extensive usage of symphonic elements, whereas bands that use them as backing themes are usually listed under other genres. Because of this, much alike with gothic metal, bands that show a tendancy towards one genre that also prominently feature symphonic elements are referred to as symphonic (genre) metal. Symphonic black metal has similar components as melodic black metal, but uses keyboarding or instruments normally found in symphonic or classical music. It can also include black metal bands that make heavy usage of atmospheric keyboarding in the music, akin to symphonic metal or gothic metal, though these bands are often more commonly referred to as gothic black metal. The symphonic aspects of this genre are normally integral parts of a band, and as such are commonly feautred throughout the whole duration of a song, in contrast to melodic black metal which focuses more prominently on guitar melodys and solos. Many black metal purists discount this genre as having nothing to do with 'black metal,' due to the heavy similarities some of its bigger bands hold with gothic metal. Claims that keyboards, female vocals and other characteristics derived from gothic metal are inconsistent with the essence of &quot;true&quot; black metal have often resulted in confusion between symphonic black metal and gothic metal bands. This controversy is further fueled by the usage of the term gothic black metal, which focuses on bands who place emphasis on elements borrowed from the other genre. Thy Serpent, Cradle of Filth, and Dimmu Borgir have all been subjects of this claim. Symphonic power metal, also known sometimes as epic symphonic metal, refers to power metal bands that make extensive usage of keyboards, or instruments normally found in classical music similar to symphonic metal. These additional elements are often used as key elements of the music when compared to normal power metal, contributing not only an extra layer to the music, but a greater variety of sound. Sometimes symphonic power metal is considered to be both symphonic metal and power metal, due to some debate about the usage of the term &quot;symphonic power metal&quot; by fans. For example, Edenbridge feature more symphonic metal elements, while Nightwish feature more power metal elements. Symphonic gothic metal: Within Temptation was founded in 1996, with their debut album Enter being released in the following year, followed shortly by the EP The Dance. Both releases made use of the beauty and beast approach delivered by vocalists Sharon den Adel and Robert Westerholt. Their second full length release, Mother Earth, was released in 2000 and dispensed entirely with the death metal vocals, instead relying solely on den Adel's vocal abilitys. The album was a commercial success with their lead single &quot;Ice Queen&quot; topping the charts in Belgium and their native Netherlands. Within Temptation's style of music combines elements of popular rock music, gothic metal and symphonic metal. Later bands followed in this trend, including After Forever, Epica, Autumn, Xandria, and Delain. The term symphonic gothic metal is also often used to describe bands that place emphasis on the keyboard extensive nature of symphonic metal alongside the atmospheric and beauty and beast natures of gothic metal. Bands that also feature dual vocalists but whos music is primarily symphonic metal, or bands with only a female vocalist whos music is primarily gothic metal are also generally referred to as symphonic gothic metal.